He treated every mod like crap, including myself now. He has made false topics, he has made false screenshots, and is making a pest of himself. He was banned for two days as a lesson, and ha not improved his attitude. You keep pestering him anyway. I'm tired of these threads!!!! I don't care what you guys think of each other, just ignore each other! He tried to make you guys work? wow! Ill give him a level 12 then if he wants you guys to work! This has nothing to do with how i feel about him dei. Hes on my buddy list LOL! Look, I could care less. I sent him a pm telling him a few things and some promises. He will stop. If he will stop, So will I. His loser team is crushed, and we only need a tiebreaker in pvp. 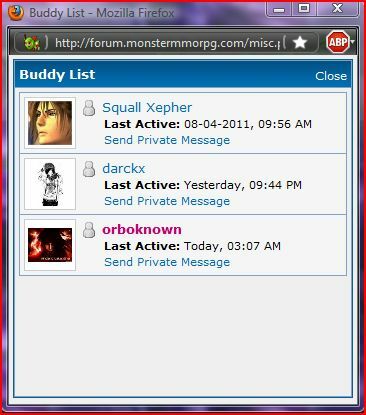 What a small buddy list..
(2011-08-06, 02:30 AM)Nitz_X Wrote: If he will stop, So will I.